Beef Rendang | Gourmet from the galley! One of our favourites, which we ate in abundance while cruising through Indonesia, is the beef rendang. Rendang is a spicy meat dish which originated from the Minangkabau ethnic group of Indonesia. [wikipedia] This dry style of curry is sometimes called caramelised beef curry because of the ‘reduction’ style of cooking. Prior to refrigeration technology, this style of cooking enabled preservation of large amounts of meat. When the Minangkabau farmers killed a cow for a special occasion it was often turned into Rendang. Rendang provided a way to make the beef last for weeks in Indonesia’s hot tropical climate. For rendang the meat is cooked for hours with coconut milk and a paste of mixed ground spices, which includes ginger, galangal, turmeric, lemongrass, garlic, shallot and chilli. This paste has antimicrobial properties and serves as natural organic preservatives. For my rendang you will need the following ingredients…. Place the onions, shallots, garlic, turmeric, salt, chillies and coriander into a blender (or mortal & pestle) and process until smooth. Set aside the spice paste. Heat the oil in a pan and brown the beef in batches. Remove from the pan and set aside. Add the galangal, lemongrass and lime leaves to the pan and fry for a minute in oil, remove and add to the beef. On medium-low heat fry the spice paste for a few minutes, then add the beef and the galangal, lemon grass and lime leaves and the coconut milk. Bring to the boil, reduce the heat and simmer for 2 – 4 hours. It is ready once the curry sauce has reduced and the oil is separating from the rest of the curry. Serve with steamed rice and enjoy the taste of Indonesia. This rendang is delicious ‘if I do say so myself’! 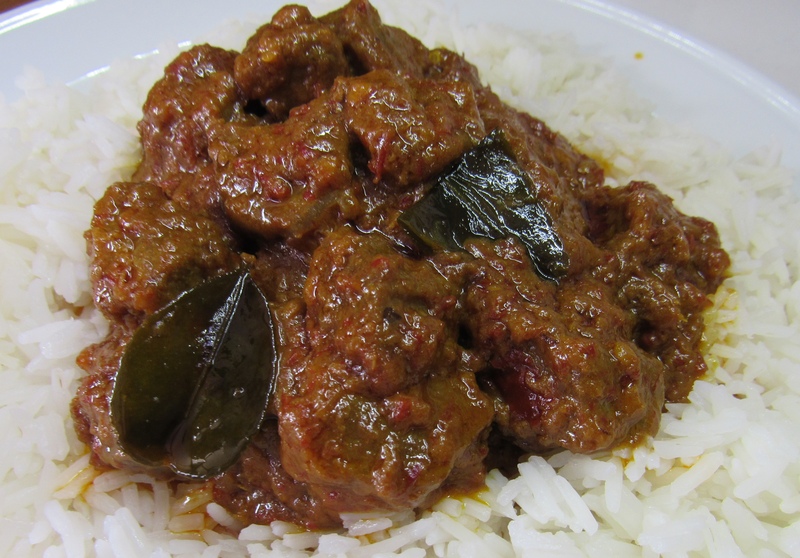 Beef Rendang – the oil separating from the curry. One of my favourite curries! I love that you guys are writing out recipes inspired by your trips! I’ve started my own series like that on the blog and its been such a wonderful collection of memories in the form of edibles! 🙂 Hope you keep at this! 2017 I really am going to get back into whipping up some more great dishes. Hope you will enjoy them. Cheers for the feedback.